When elven prince Elan finds human refugee Jenna in a bear trap, he abandons his father’s orders and takes Jenna and her children to a human colony for healing. The humans try to fail to repel them at the gates, but when assassins attack the colony and injure one of Jenna’s children, Elan rallies the elves to protect the colonists. Amid the chaos, Elan falls in love not just with the children, but also with their mother. But his teacher, Linolde, wants Jenna’s new crown and will do anything to get it. When she kidnaps the children and breaks the spell keeping half the world in Twilight, Elan seeks the Forest King to stop attacking the colonies and help find his missing children. But tree nymphs are childlike, and their king is throwing an epic tantrum. If Elan can’t convince the Forest King to find Jenna’s children, the Twilight realm will fade and send the world into chaos as the dependent beasts flee to the lower realms. Can Elan save the world, including himself? This book takes place generations, 53 years since Mother (the Earth) decided to purge mankind from her. She was furious that humankind had desecrated her while she was asleep and her temper snapped. There were natural disasters, continents were reshaped, oceans were reshaped and humankind was just about wiped out. The elves were charged with reconstructing the earth and restoring Mother to full health. Any humans who survived the purge were rounded up by the elves and kept in colonies. 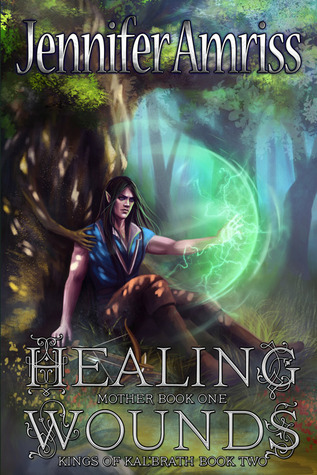 Elan is the Prince of the Summerland, son of Kennan, the King and Kennan was the elf who was at the forefront of the healing (ie reconstruction) efforts. Elan and Kennan didn’t see eye to eye on how the humans were being treated and what happened to them. Elan actually didn’t speak to his father for 53 years because of that. They reconciled when Kennan showed Elan exactly WHY the humans needed to be kept under a firm hand and kept under watch. Because they would do the same thing and the Mother would have to take drastic measures. The story truly begins when Elan goes through a gate to what used to be Pennsylvania. Kennan wants him to plant seeds and document the humans. Almost immediately, he hears a scream and when he goes to investigate, he finds a human woman caught in a bear trap….with her children hovering near her. Fear of the elves (the little girl called him long ear) is present in the children and in the young woman but the elves are allowed to help her out of the trap. They learn that her name is Jenna and her children’s names are Sam and Alyssa. One of the elves, Linolde, objects greatly to Elan helping Jenna but she is put in her place by Elan. They take her to the Allegheny Colony to be healed and Elan bonds with her children and learns that Jenna has been living on the outskirts of the colony. They fled her husband and the colony that she came from because her husband believed that Alyssa wasn’t his (because she didn’t look like Sam). She was beaten and stoned but managed to escape. Certain people in the colony (I believe it was her ex-husband) followed her colony to colony and would stone her. Finally, she started living in the woods and moving as soon as she found out they were at the colony she was near. So, to be honest, life sucked for her until she met Elan. It wasn’t all smooth sailing for them once they get Jenna situated into the colony. Sam is attacked by a wood nymph, Linolde is acting up and, when Jenna’s leg is healed, Elan is told by the Mother that she needs his seed to make a baby with him and that she was his mother (which was a huge ewwww moment for me) and Elan and Jenna soul bonded (which means that they are basically married in the Summerlands). They were unsure if she would survive the bonding….seeing that this is the first time that it has happened. But she does. They (and the children) go back to tell Kennan what happened. He is overjoyed and he dotes on the children. Elan has to go back to the colony and while he is there, Kennan and Jenna are attacked. While they are being attacked, Sam and Alyssa are taken to some ruins and then they are trapped inside a magical house where they can’t get out. The rest, well you have to read the book to find out what happens. The wood nymphs are featured heavily in the last part of the book. Lugh, the King of the wood nymphs, did remind me of a tantruming 3-year-old….lol. The ending was perfect. All of the storylines were wrapped up in a satisfactory way and I loved seeing a certain elf getting her just dues!!! Why: Another well-written fantasy by Jennifer Amriss!!! A book that I got lost in and I genuinely started to care for the characters.